Aloha SUPers/surfers and mahalo for dropping in with Blue Planet Surf. A frequent customer inquiry at our shop is how to go about choosing the best fin setup and what types of fins offer the best performance. As avid water enthusiasts, our main objective at Blue Planet Surf is to provide sufficient info to SUPers and surfers, so that they are equipped with the best knowledge to make the best decision when buying their first performance set or additional sets of fins. With the right knowledge, one can choose the best fins to suit their surfing/paddling needs and ultimately have more fun on the water. Along with the video above, you’ll find images and descriptions below that will help you with the detailed process of finding the right fin setup and fins for you. John Scott Bly can best be described as an equipment and technology junkie. Almost every morning on any given day, John can be found in the water whether he’s bodyboarding, surfing, SUPing or getting media. His love for the ocean started in his youth as a local boy from Waipahu and morphed into a part time job at Blue Planet Surf Shop in Honolulu. At Blue Planet John frequently provides detailed insight to customers on how to go about setting up their fins and choosing the right style/construction for their unique needs. If you have any questions about the information presented in the video or below, please contact Blue Planet Surf in Honolulu, Hawaii; or consult your nearest SUP/surf shop for more info. There are many different ways of arranging fins on a board and each setup has its own distinct characteristics. Play around with different setups and find what works best for you. A single fin is ideal for a classic style of surfing and for optimizing nose riding. Single fins are also ideal for SUP races because they provide stability without the unnecessary drag created by additional fins. Twin fins provide dramatically increased speed and maneuverability. The drawback to twins is that it doesn’t provide a lot of hold especially in the bigger surf and things can get pretty squirrelly. A thruster set (3 equal sized fins) or a 2+1 (1 larger center fin, 2 smaller side fins) bridges the gap between a single fin and a twin fin. The center fin will add stability while the two side fins allow for control and quick turns. Quad setups allow for more speed than a thruster and more control than a twin. The downside is they lack the control a thruster offers, and feel loose in the pocket. Quads are also good for big wave surfing because they provide moderate hold in the face without compromising your speed. Five fin setups are less common in the surf world but if you’re looking for maximum control, a five fin setup might be a good idea. The drawback would be a lot of drag created by the extra fin. A five fin option without compromised speed would come from adding a knubster or smaller center fin. Fins can be made out of many different materials, each with its own distinct properties. If your board came with free fins, chances are that they are made of plastic. While cheap to manufacture and replace, plastic fins really are not up to the task if you are looking for performance. They flex too much in an uncontrolled fashion and can make the board unpredictable and slow to react. Fiberglass fins or a combination of fiberglass and carbon fiber usually results in the best overall performance. Fiberglass fins are stiff and provide a lot of hold and drive which makes it good for big waves or for powerful surfers. The drawbacks however are that the fins tend to be kind of heavy and the stiffness of the fin hampers it in smaller surf where a bit of flex can help you generate speed. A fiberglass/honeycomb fin reduces fin weight and adds some flex, allowing the fin to work in smaller surf, making things easier to generate speed. A full carbon fiber fin will perform similarly to fiberglass, however it will be stiffer and lighter than full fiberglass. The drawback with carbon fiber is cost and brittleness. With carbon fins, the fins will have a tendency to crack or break when taking a tough impact with the reef. Fin manufacturers have begun to make fins with a combination of carbon fiber and fiberglass, combining the best aspects of both. A carbon base with a fiberglass/honeycomb tip will create a fin with a stiff base for drive while having a bit of flex in the tip to help with generating speed. Other combinations include a carbon base and tip with honeycomb in the middle. An example of this would be a Futures Techflex fin. The Techflex design is one of my personal favorites as it allows the fin to be stiff like fiberglass but lighter than honeycomb while allowing for a very controlled flex to handle more powerful waves. Generally speaking, the single most important aspect of a fin is the surface area. Usually measured in square inches (in the US), the surface area of the fin tells you how big the fin is and how much control you can get. 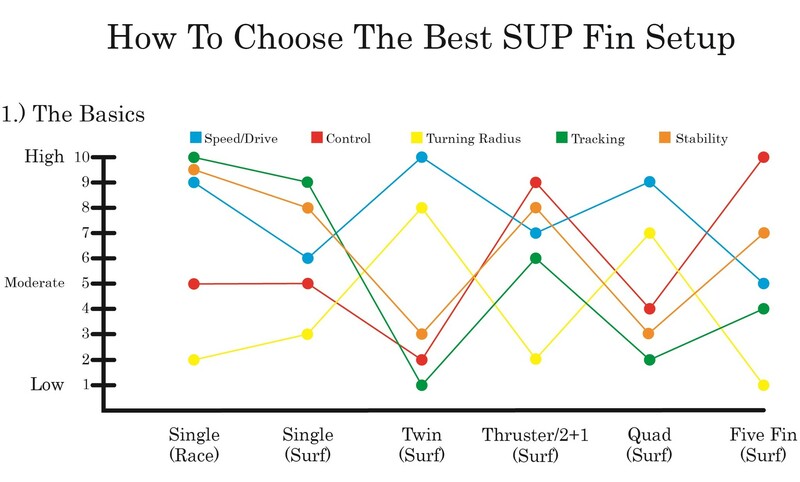 No matter what brand of fins you choose, you should select your fin size based off the rider weight and performance preference. The bigger the rider, the bigger the fin needs to be in order to grip into the face of the wave. If the rider wants a looser or more skatey feel to the board, one option would be to go to a smaller fin size. If they find that they are sliding too much or not generating enough hold on the wave, a bigger fin might solve the problem. The base of the fin, measured from where the fin touches the board in the front to where the fin touches the board in the back, affects drive. Drive is how much acceleration you get off of your turns and how much speed you can generate while pumping down the face. As with everything surfing related, there is always a compromise. A fin with a wider base can be a little difficult to initiate a turn because the board will want to project forward rather than pivot up the face. On the other hand, a fin with a narrow base will pivot really well but it will be difficult to generate speed from pumping. The height of a fin is very important in creating stability. The taller the fin, the deeper it protrudes into the water, acting like the keel of a sailboat. This helps to keep the board from tipping. Along with stability, your fin height will affect general hold and control form the tail. In the SUP world, a taller fin will enhance stability and perform great in downwinding conditions, but it can create unnecessary drag in flat water conditions where a shorter fin usually optimizes performance. The rake of a fin is how far the fin sweeps back from the base and it will affect stability and how tight or loose your turning arc will be. More rake translates to more stability at speed and also more drawn out, carvey turns. Less rake (a more vertical fin) will be less stable at higher speeds but offer tighter radius turns and you’ll be able to do snaps rather than huge rail carves. If you look at a fin’s edge from the front, you will notice that it looks a lot like an airplane wing. It serves the same purpose, which is generating lift. Lift raises the board out of the water and helps you generate speed. There are a multiple foil types, each serving their own purpose. A flat foil on the inside of the fin will help you control your speed, rather than generate speed, which works better in more powerful surf where you don’t need to generate speed. An inside foil or concave section on the inside of the fin will help accelerate water across the fin, creating more speed which works better in smaller waves where you have to pump to stay with the wave. A symmetrical foil or when both sides of the fin are convex, is typically used in the center fin of a thruster setup or on the rear fins of a quad setup. Symmetrical foils are used on those fins mainly to provide stability to the board. Fins can dramatically change the behavior of a board. Minute changes in template design can wake a board up and make it come alive or it can make the board feel sluggish and slow. Whether you change a fin template entirely or maybe go to a different construction of your favorite template, surfing is all about experimentation and finding what works best for you. Who knows, maybe one day you will be able to find that magic setup that we all dream about.